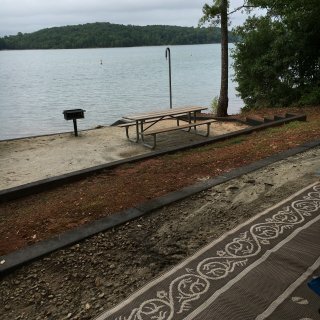 This campground has water and electricity at the sight. No full hookup that I am aware of. The sites are shady. Many sites have a lake view but only if you stand up at the balcony railing. 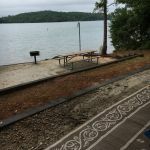 Most sites have a deck with picnic table and grill, firepit, and pole for hanging. The sites are very large with plenty of space in between. My personal favorites are 15,16,19,20. They are pull through with very large camping area. 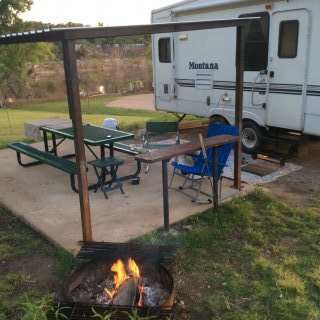 The firepits on those particular sites are located well away from the camper parking area. There are a few walking trails. It is about 30 minutes from Tuscaloosa where there are plenty of restaurants and activities. The Riverwalk was my favorite. The Pine Bluff section may be a little difficult to navigate for big rigs, but the roads are paved and the pads are concrete and level. We camped at Deerlick Creek COE in a Travel Trailer. We were here just for an overnight, but most people we met were there for the season. The owner was very nice and invited us to join their evening "happy hour" that included campers and dogs! Everyone was friendly. There are only 17 sites and all back up to the river. The space between sites was more than in many parks. There was a concrete patio and picnic table at each site. Most sites appeared to have some shade. The site was gravel and required very little leveling. All sites were full hookup. 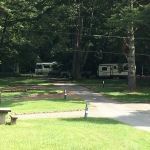 We camped at Riverbend RV Park & Campground in a Travel Trailer. This park is definitely an older national park campground. Some of the sites are quite short but the fire pits and picnic tables are spaced sufficiently away from the parking area. Some sites are shady and some are in full sun. We enjoy the cool temperatures in this park and even though you are dry camping with no showers available, it is quite pleasant. There are many places in the area to visit. The one thing I do not like is the curb around each parking pad. That creates some difficulty with parking and using the awning to set up sitting space. There is water available at the dump station prior to entering the campground. There are spigots spaced around the campground for additional use but they prefer you use the water at the dump station for complete filling before entering. 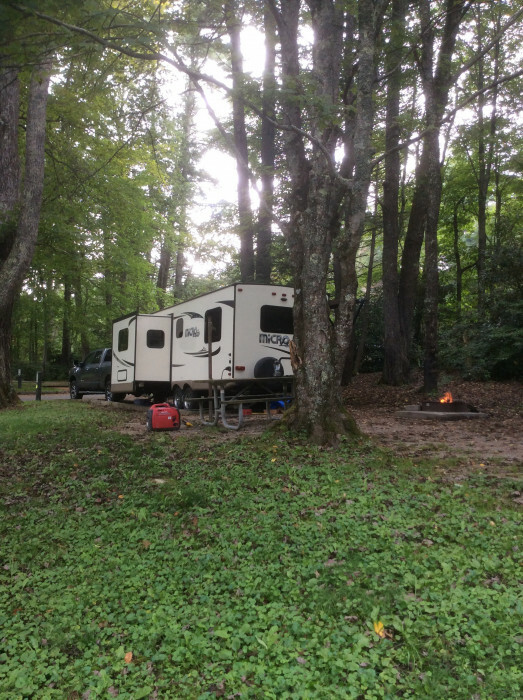 We camped at Linville Falls Campground-Blue Ridge Pkwy (NPS) in a Travel Trailer. Driving on the Blue Ridge Parkway. Shopping and dining in Blowing. Walking at Bass Lake in Blowing Rock. Visit Grandfather Mountain. Eating breakfast at Louise's Rockhouse in the community of Linville. Hiking. We camped here in a travel trailer. It had been raining just prior to our arrival but the roads are paved and the campsites are gravel. We were in site 10. We had a beautiful view of the lake. The fire pit and table are at a lower level that is lakeside. We really liked sites 12 & 13 also. The Verizon was excellent. The OTA antenna picked up about 40 channels. We could not get DISH satellite from our site. The entry to the campsite is quite steep but some not as much so as ours. 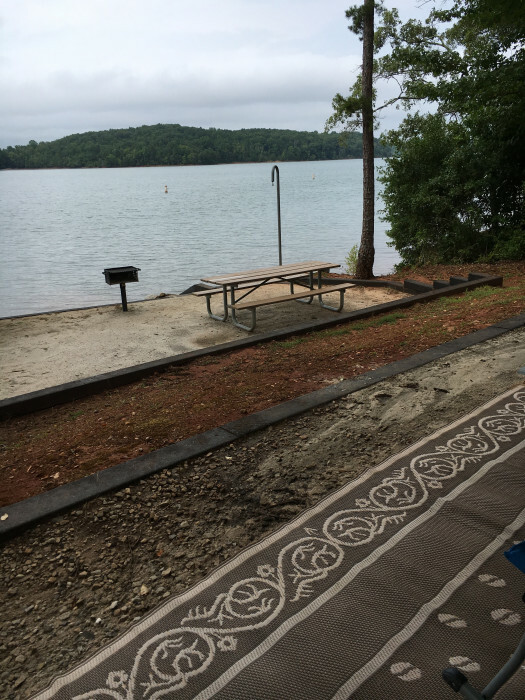 We camped at Paynes Creek (Hartwell Lake) COE in a Travel Trailer. 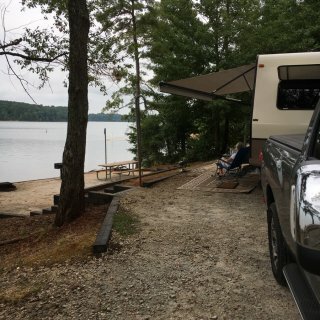 We used this campground for a overnight stay. It was very convenient to the road we were traveling. There were only 17 sites, with most being back-in but we found one long pull-through. There is electric at the site and central water for fill up. The camp fee is $20 but there is a day fee that must be paid and it is $8 for non residents. The sign on premise is a bit confusing as it tells you where to buy the day fee. Because I had read someone's earlier review, I realized there is a place on the envelope to check to pay the fee and the entire payment can be put in the envelope and deposited in the lock box. The grass was nicely mowed and the flush toilets and showers were extremely clean. We were the only ones there for a few hours and then one other camper arrived. I would definitely stay here again. 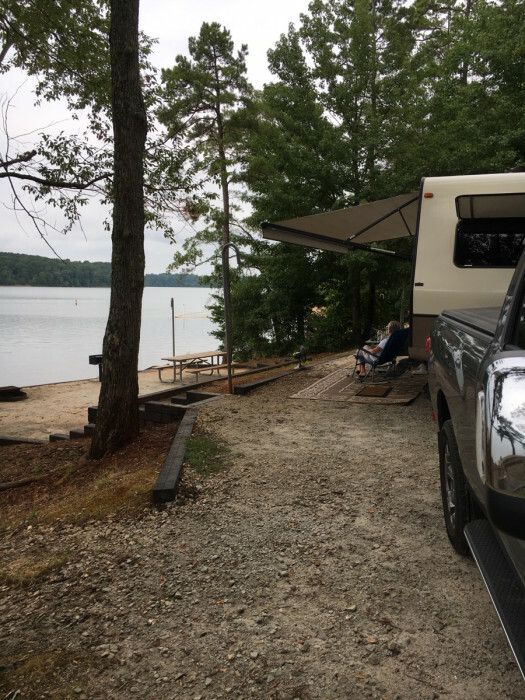 We camped at Swainson Reservoir SRA - Macklin Bay in a Travel Trailer. There is no attendant at this park. You find a place that is not reserved and pay by envelope in box. The sites are large with views of the lake in most all. 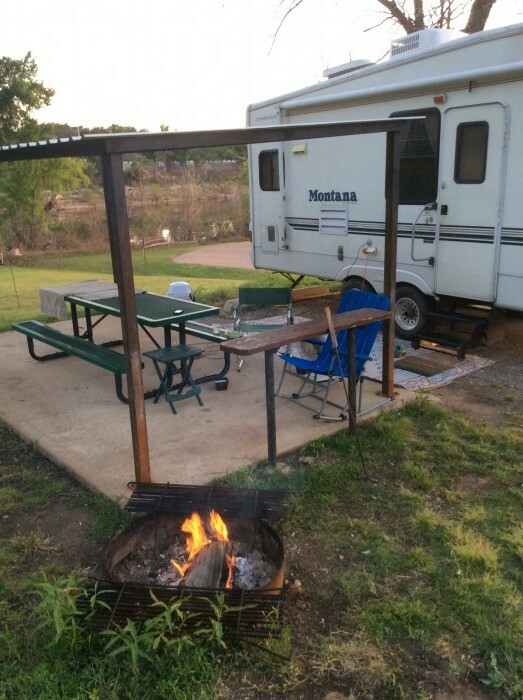 The road is paved with gravel, level sites that have fire pits and tables. The park is surrounded by mountains. The lake is the most beautiful anquamarine color this side of the Caribbean. All sites appear to have electric with water spigots throughout. I would definitely like to spend more time here. There is a dump station available. We camped at Bear Lake State Park in a Travel Trailer. I would have given this a 10 except the layout of some of the sites were awkward and small. There were many sites that were ideal in size. The camp hosts were helpful. The Park was very clean with lush green grass. The sites were asphalt and level. 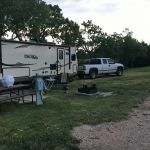 We camped at Custer State Park - Grace Coolidge Campground in a Travel Trailer. Multitude of things to do in park and around Custer. This is fine for an overnighted. The sites are dirt but fairly level. There is water at some sites and electric at all. There is a bathroom code to prevent vandalism but we did not use the facility. Just pull in and select a spot, get an envelope and drop in box. The first night is free. We camped at Brush Memorial Park Campground in a Travel Trailer. These rare some of the largest campsites I have ever seen. They are extremely clean and widely spaced. They are electric only but there are plenty of water spigots for filling. There are heavily shaded areas with limbs well trimmed and open sunny sites. Each site has table with cabana and firepit. 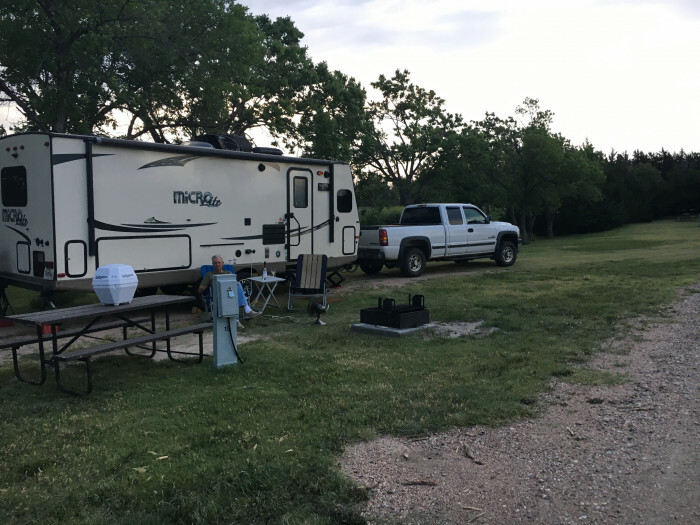 We camped at John Martin Reservoir State Park in a Travel Trailer. This park has very narrow roads and mostly short asphalt. Water and electric hookups are distant to the sites in some cases. The park appears very neglected. It is gated requiring a code to get in and out. We would probably not stay here again. We camped at Acadiana Park Campground in a Travel Trailer. 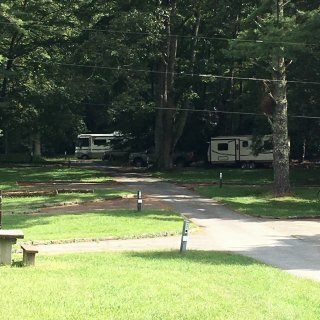 The campground was extremely clean. The person checking us in was helpful and efficient. The sites are very widely spaced so there is a feeling of privacy. The sites are paved and level. There are no fire pits but there are tables and grills at each site. There is a lovely view of the bay and nice piers for sunset views. The campground is between I-10 and 90 so there is always some highway noise, but it is not overwhelming. I would definitely stay here again. 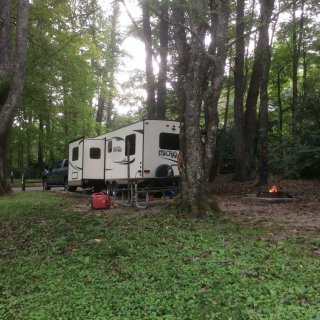 We camped at Meaher State Park in a Travel Trailer. We were only here for overnight but passed a lot seafood restaurants and it is close to Mobile. The site was very clean and very large. This was a full hook up site. The fire pit was placed a nice distance from the RV parking area. We were able to get Verizon and a few over the air channels. The sites are quite shady and there is a good amount of vegetation between sites which gives adequate privacy. There is cable hookup. It is a good place to stay to visit St. Simon's Island and Jekyll. We would definitely stay here again. We camped at Blythe Island Regional Park Campground in a Travel Trailer. 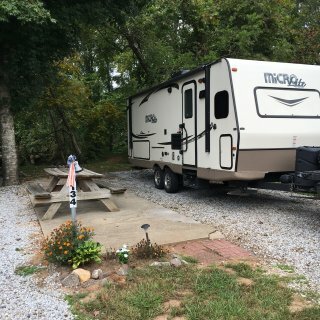 We were charged $40 for 15 amp service which was quite inadequate for travel trailer. Lots of potholes and mudholes. The dump had huge mud hole making it impossible to get out of vehicle without stepping in water. I would not return. 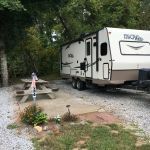 We camped at Rainbow Valley Campground in a Travel Trailer. The sites are very shaded. Many sites had very uneven entrances and pads. The overall impression was that it needed a bit of upkeep. Some sites looked good. The views of the lake are nice. We camped at Poole Knobs COE in a Travel Trailer. 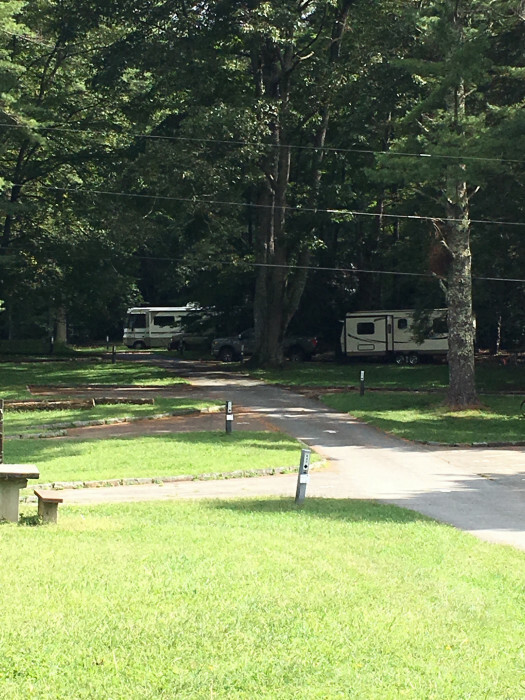 The biggest negative about this campground is its proximity to highway 70 which creates a lot of traffic noise. We were in site 50 which is the closest to traffic noise. Some of the other sites are further from traffic and closer to lake. The grounds were somewhat neglected with fire pits having trash in them. Our Verizon and Dish tailgater worked well. Some sites were very shady, but ours was fairly open as it had the boat launch area on one side. There are no trails for walking. The person who checked us in was very helpful in that she allowed us the option of choosing any open site even though we had a reservation. If you Re traveling east on highway 70, as soon as you exit the bridge that crosses the lake, there is a small brown sign on the right that says Johnson creek. The turn is to the left and it is easy to miss. 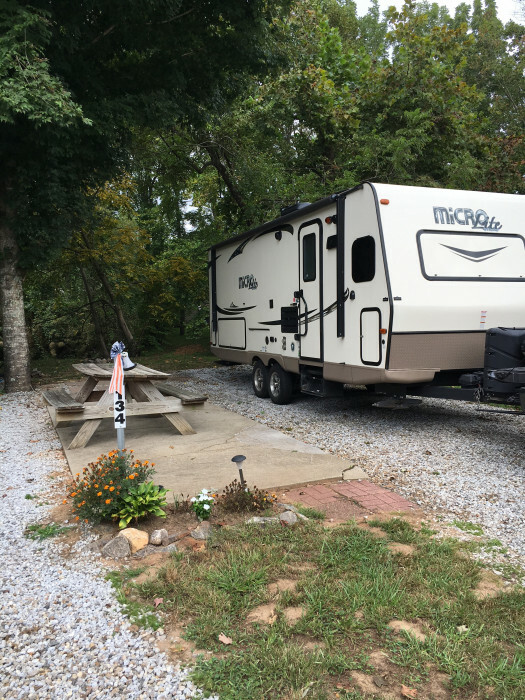 We camped at Johnson Creek COE in a Fifth Wheel. Durant has anything you would need.